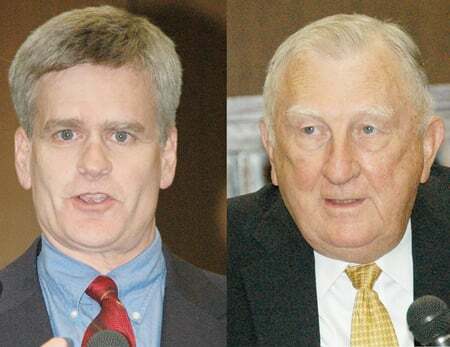 U.S. Rep. William "Bill" Cassidy (R) and challenger Merritt McDonald Sr. (D) both speak to the newly formed Livingston Parish Tea Party organization, which held a forum at the Denham Springs City Hall Wednesday night. Tea Party Patriots of Livingston Parish President Laura O’Halloran welcomes her audience and explains that the newly formed group in Livingston Parish, which now has 64 members, is not a political party and does not endorse candidates, but encourages citizen participation and self-education in the political process. Sitting on the front row in the audience of the Tea Party waiting their turns to speak are (from left) Malcolm Richard, Baton Rouge Regional Director for U.S. Senate incumbent David Vitter; Jason Hebert, representing Secretary of State Jay Dardenne; U.S. Rep. Bill Cassidy; Maurice Durbin, friend and supporter of Secretary of State candidate Caroline Fayard; Cynthia Fayard, mother of Caroline Fayard who spoke to represent her daughter. DENHAM SPRINGS - Both candidates for the Sixth Congressional District seat, incumbent William "Bill" Cassidy and challenger Merritt McDonald Sr., spoke Wednesday to the Tea Party Patriots of Livingston Parish. Surrogates for state Lieutenant Governor candidates Jay Dardenne and Caroline Fayard also spoke, along with Malcolm Richard, Baton Rouge Regional Director for U.S. Senate incumbent David Vitter. Early voting at the Registrar of Voters Office in Livingston ends Tuesday. The election is Nov. 2. McDonald, 79, a retired engineer, Baton Rouge resident, and Democrat, has never held public office and has no formal campaign organization. Cassidy, 53, a medical doctor and Republican, is also from Baton Rouge. McDonald said he was "very disillusioned with what is happening to our country." Will our grandchildren be speaking Chinese or Spanish; will they have money; will they be able to vote, McDonald asked an audience of about 30. "Will we reach a point in history where we can no longer govern ourselves?" McDonald asked. 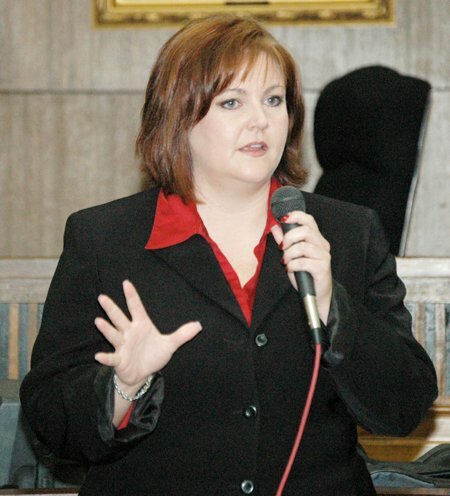 McDonald said government officials should be elected to carry out duties, comparable to military ranks. One of those duties would be to cut spending. "The government can't be everything to everybody," McDonald said, but in the attempt, tax money that should have been spent maintaining railroads and essential public infrastructure has been squandered. McDonald recommended reducing foreign aid and moving the United Nations headquarters to Africa. Many government agencies have outlived their usefulness, McDonald said. "The missions of all government agencies need to be justified," McDonald said. "We have bureaucratic gangrene," McDonald said, and agencies not providing essential services need to be "amputated." A solution to illegal drug use must be found, McDonald said, and referenced Middle Eastern countries which use draconian measures to punish illegal drug use. Former Denham Springs councilman Robert Poole asked McDonald if he would vote to repeal "Obamacare." "In a New York second," McDonald said. McDonald also mentioned the problem of illegal immigration, which he said should be addressed militarily. "We are being invaded by foreigners," McDonald said. Cassidy agreed that until the government can protect America's borders, citizens will lack confidence in the government's capacity to protect the country. Loss of jobs is ruining the economy, and Americans need to have the opportunity to buy products manufactured domestically, "not just assembled here," McDonald said. Cassidy agreed with McDonald about the need to create more jobs to help revitalize the economy. "Don't crush (job creation) with taxes and regulations," Cassidy said. Government regulation can inhibit job growth by sending companies overseas, Cassidy said. The economic stimulus combined short term economic goals with spending intended to initiate social transformation, Cassidy said. "The social transformation was not debated, and I think that angered the American public," Cassidy said. Cassidy referenced Chief Justice John Marshall who said that the power to tax is the power to destroy. The Tea Party movement is trying to revitalize the country around another vision for the future, and is demanding that elected officials represent the people, "rather than dictating to them," Cassidy said. Cassidy spoke in favor of health savings accounts, saying that they make patients shop around for the most reasonably priced medications and medical care. When insurance pays, the patient may feel entitled to get his money's worth for premiums paid, Cassidy said. Paying for medical care out of "your own pocket" encourages people to make the best choices "for their family's health and for their checkbook," Cassidy said. Instead of re-thinking entitlements, the Obama administration is more apt to "cannibalize" one entitlement to create another, Cassidy said. In the Lieutenant Governor's race, Jason Hebert represented Secretary of State Jay Dardenne and Cynthia Fayard represented her daughter, Caroline Fayard. Hebert said Dardenne is "a fellow Tea Party member" who is "conservative, effective, and visionary." Dardenne, 56, is "pro-life, pro death penalty, and against gay marriage," Hebert said. In terms of new goals for the Lieutenant Governor's office, Hebert said that Dardenne would try to "link north and south Louisiana" and attract more cruise ships. Fayard said her daughter, a Denham Springs native, is supported by people who are willing to vote the issues and not follow strict party lines. Caroline Fayard, 32, has a plan to make Louisiana more attractive to business and to tourists. "That's the job," Cynthia Fayard said. "Caroline is not going to use the office as a stepping stone to the next job." The lieutenant governor elected Nov. 2 will serve out the remainder of Mitch Landrieu's term, about a year. Both Fayard and Dardenne are lawyers. During the question and answer period, Fayard said that although the candidate has received support from former president Bill Clinton, neither she nor her daughter supported President Obama or his health care bill. Caroline Fayard will be "a lobbyist for all the people," her mother said. Richard, Baton Rouge Regional Director for Sen. David Vitter, said the incumbent wants to end wasteful spending, "has never voted for a tax increase," and supports the Tea Party movement. Vitter opposes welfare for illegal immigrants; opposed President Obama's heathcare package; and opposed the "Wall Street bailouts" under both Bush and Obama, Richard said. "We want to keep America on the track that has made it the greatest country in the world," Richard said. This was our second meeting and first event as a group! A lot of information was shared by the speakers, and it was a great opportunity to get to know them face-to-face. Hot topics such as Obamacare and illegal immigration were discussed and a lot of questions were asked. Our goal is for everyone to learn something and gain more insight on our candidates and issues, so that we may become more informed voters and better citizens. This was the first meeting that I have attended and it was very informative. I plan on attending future meetings. Thanks to the organizers of this Tea Party group. Whoever wins should work together to solve our problems. Partisan warfare must end. You're not elected to serve the party but to serve the people.